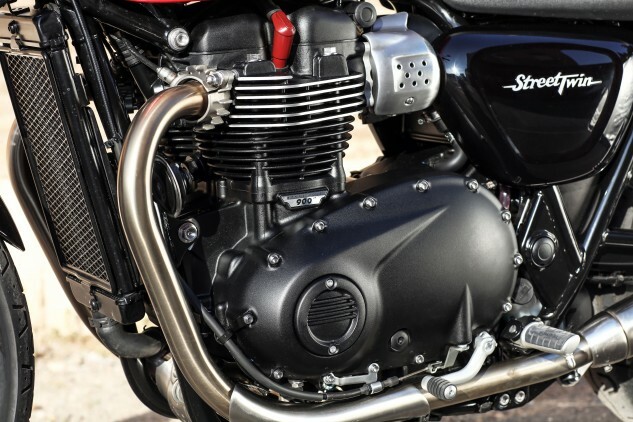 New vehicle certification documents from the California Air Resources Board and the U.S. Environmental Protection Agency confirm two new Triumph models sharing the Street Twin‘s 900cc engine. The government agencies officially certified two new models for 2017, a new Bonneville T100 and a new model to be called the Street Cup. We may have already seen the Bonneville T100, at least in pre-production form (pictured above). 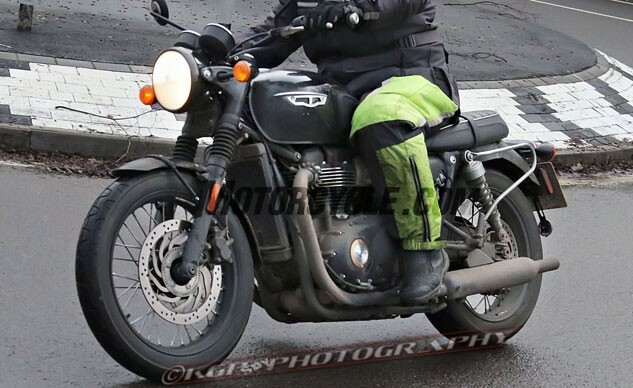 Those spy photos, snapped outside Triumph’s headquarters in the U.K., show a bike that looks similar to the recently-introduced Bonneville T120, but with the smaller engine from the Street Twin. The Street Cup is more of a mystery. Triumph typically likes to pull model names from its 130-plus year history, especially with its “modern classic” models. The “Street” part maintains that tie to tradition, but “Cup” would be a new entry to Triumph’s nomenclature. “Cup” may suggest a racing variant (Triumph has in the past operated a Street Triple Cup and the American Historic Racing Motorcycle Association still runs a Thruxton Cup Challenge), or perhaps a cafe racer version of the Street Twin. If you really want to stretch your imagination, another possibility is a touring version (i.e. the “Cup” being a smaller “Trophy“). The certification documents confirm the engine will be the same 900cc parallel-Twin engine introduced on the Street Twin, EPA-rated at 54 hp at 5900 rpm and tested by us at its rear wheel at 52.6 hp and 57.8 lb-ft of torque. The only difference, noted by both the EPA and CARB, is an increase in carbon monoxide emissions in the 2017 engine compared to the 2016 Street Twin’s powerplant. The 2017 engine is rated at producing 2.7 g/km of CO, up from the 2016-certified 2.0 g/km, but still well below the CARB and EPA standard of 12 g/km. We expect to hear more information in the months ahead, with an official announcement to come at this fall’s Intermot or EICMA shows (if not sooner). As always, Motorcycle.com will have the latest, so keep checking this space!